UGH! Y-Seams!!! Deborah asked for Mid-Century Modern designs for her blocks for Piece Bee With You this month. The Y-Seams were entirely my fault, as I drew them in, but I couldn’t see a way to draw them out – grr. Anyway, hope you like your angle-poise lamp Deborah, because those angles did not leave me poised! Hope everyone else had a better sewing day! Wow, that's amazing. It may have been difficult but what a spectacular result. whoa katy! owl last week and this one, i'm mega impressed — i need to get on my paper piecing! Wow. Just wow. I can't believe you worked that out and whatever you think may be wrong with it no one could ever know. That's awesome! This is such a great block! I did a y seam with pp and thought I would never do another pp project. That is no fun! Are you designing your own paper piecing patterns? I am uber impressed with this one! And last week's owl!!! OMG!!! Katie, it's absolutely fab! I love it! I had the same problem with Y-seams when I was 2/3 into Jane's block in October. Scrapped it and started over, minus the y-seams, so I appreciate that you stuck with it to the bitter end 😉 Thanks bunches! Shine a light on me…this is fantabulous! Katy, you are amazing … I don't even know what a Y seam is! LOL! Wow, this is brilliant. I wouldn't know where to start. 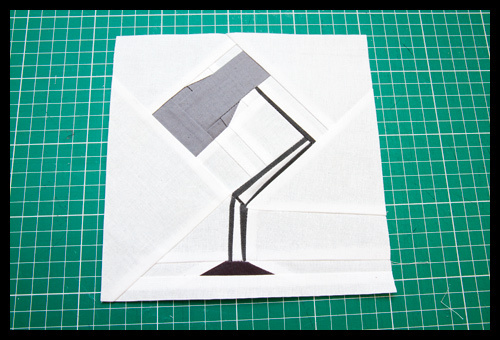 And I tried a Y seam the other week – just the once then decided against it. How did you overcome it? Oh my golly gumboots!! That it awesome. It was worth all those tricky y seams. Amazing! HaHa! I'm waiting for everyone to demand a tutorial from you now!! The block is brilliant. It may have been a challenge but my goodness it looks good! What a designer. It is just great. And I thought this was meant to be the easier option! Okay, how did you manage this?!? It's totally amazing! You are freaky talented. It looks terribly complicated – but a most wonderful finished effect – you are so clever!